The Lifeblood of Your Design! Rhythm and Motion are the lifeblood of a dynamic garden. Creating a sense of movement is vital to good design. Without it a garden can seem flat and uninteresting, even if populated with the richest of plantings. Rhythm is defined as the "movement or variation characterized by the regular recurrence or alteration of different quantities or conditions”. Let’s simplify that definition of rhythm! In the endeavor to construct our gardens, the term “rhythm” represents our use of some form of repeated element to unify and create the illusion of motion. So, the bottom line is this; we use repeated elements within our garden to draw the eye through it in some fashion. Everyone knows what repetition is. 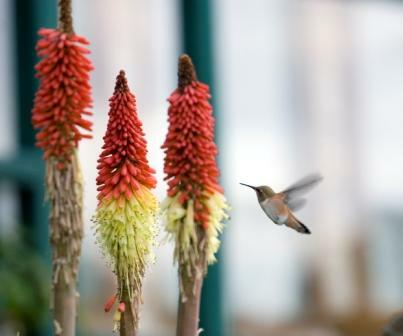 Not everyone knows how to use it to create a sense of movement in a garden! So what is movement then? We are all familiar with movement in the kinesthetic sense. Our hands move and grip, touch, or push things away; our legs move us from place to place, and our head moves to allow our eyes to take in the world. In the design disciplines, the term movement is used to describe the how we move our eyes when viewing a design. In our case, that is the garden. So the concept of movement is applied to the garden by recognizing that the garden is a canvas, and your plants, hardscape, and furnishings are the medium with which you create a desire to “move the eyes”! To make this concept of movement clearer, let’s look at the use of movement in art. The next couple of drawings are great illustrations of creating a strong sense of motion. First, Alice’s Adventures in Wonderland by William Heinemann in 1907. 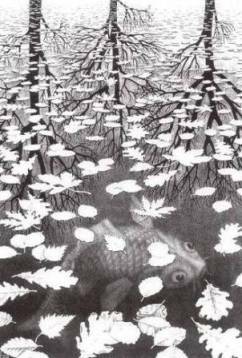 In this drawing, the illusion of motion jumps out at you! You can’t miss it. 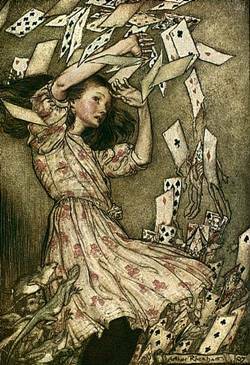 The print is two dimensional, yet it is easy to see that the cards in this picture are attacking Alice. Notice how your eyes move through this picture. You likely focus first on the face, since we all know instinctively that a face is expressive. But your eye is caught immediately in a whirlwind of motion, circling through the picture from top to bottom and then stopping. Now for a second illustration of the illusion of motion. This piece is entitled 'Three Worlds’, and is by M.C. Escher. This is another perfect example of creating rhythm and motion in art. Note the repeated elements throughout the picture. Three trees shadow the top of the picture, evenly spaced across the top, and darker than the rest of the picture. Your eye goes immediately to those darkest lines in the drawing. The leaves are also repeated elements. These provide an element of rhythm that draws your eye down the picture to the surprising new element at the bottom, a catfish swimming under the surface. Your eye is led through the scene to the most important element in the picture. The fastest and easiest way to demonstrate the use of repetition in the garden to create a sense of motion is to show you. The following set of photographs is designed to help you see how the use of various design elements can enliven your garden. Get ready for a dazzling set of garden photos to help bring this concept to life! Color is an excellent way to repeat an element and draw the eye in such a way as to create a dynamic sense of motion. 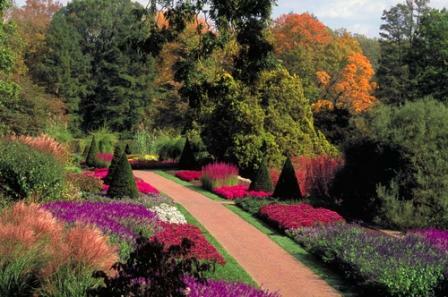 In this photo of the Longwood Gardens in Kennett Square, Delaware, Pennsylvania, USA, it is easy to see how the repetition of color has been used to create this dynamic sense of movement. The purple, red, and hot pink color of the flowers almost demands that your eye quickly travel the path from the bottom of the photo to the top. Rhythm and motion in action! Here we see the element of texture element of texture used to accomplish a similar task. 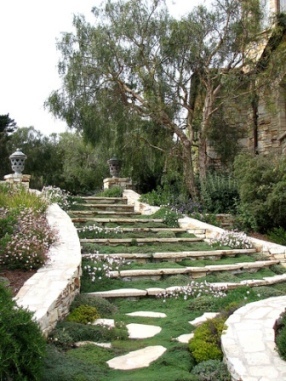 In this jaw dropping treatment of a flight of stairs in the garden, a sense of movement is created entirely using the repeated elements of white, rough stone and the beautiful creeping thyme on every tread. Your eye is drawn first to the stepping stones at the bottom of the picture, and then swiftly drawn up the center of the picture by the green thyme and the eye corralling white walls. Your eye never stops until reaching the top of the stair. An element of motion is also introduced in the flowing curve of the white walls which adds grace and beauty to the scene. Here is another example of rhythm and motion at work. 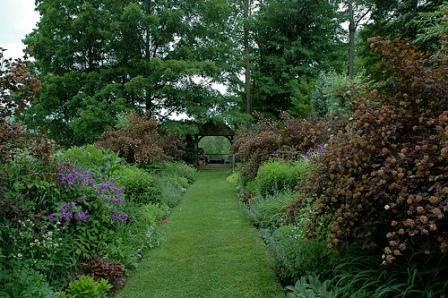 In this photo of Hayward Garden, in Westminster West, Vermont, USA, we see another form of repetition which leads our eye to the most important element in the garden. Repeated forms are seen in the selection of trees and mounding plants used in both borders for a very balanced example of rhythm and motion. Plant forms are one of the most easily employed forms of repetition. A selection of tall plants with vertical lines scattered throughout a garden of somewhat shorter plants is an automatic win in creating a sense of rhythm and motion in the garden. Remember, what you are striving for is to lead the eye around or through the garden. Repeating a shape within the garden can be another way of creating a sense of rhythm and motion in the garden. In this lovely formal garden, there are several elements of repeated shape. The most obvious are the lines of boxwood hedge that surround all of the plants. But notice two other elements of repeated shape. 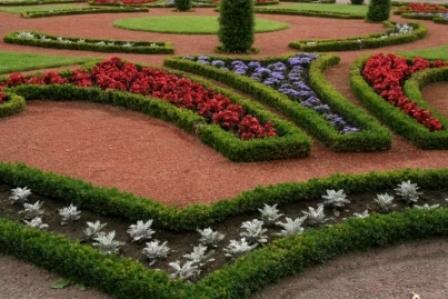 First, the same plant forms are used in all of the garden beds in the center of the picture. The colors are red and purple, but the basic shape of the plants is nearly identical. The same plant shape is also used throughout the garden bed at the bottom of the photo as well. Also, note that the curved shape is present in every line of this garden. This creates a unity in the garden and a rhythmic flow throughout. The final effect of all of these repeated elements is to thrust the eye into the distance, with a couple of stops along the way to take in the dramatic colors. In both the photo above, and in the photo below, we see a repetition of line that creates a strong example of rhythm and motion. In this photo, we see a very strongly repeated set of lines. 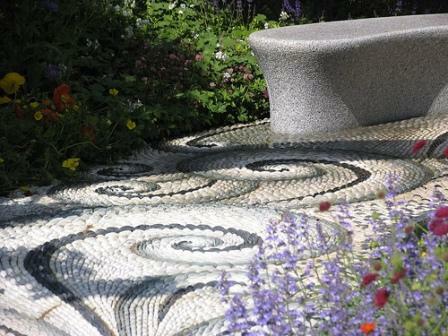 The stones in this mosaic are laid in a dramatic set of near circles which immediately capture your eye. These dramatic whirls of dark line echo the curves of the garden bench set to the side of the garden space, and give a real sense of drama to a garden area that might otherwise be fairly mundane. It is exciting, isn't it, to realize how easily the principles of rhythm and motion can be leveraged to design original, exhilarating garden spaces! Get creative! Look at your garden design in a new way, and ensure that you create a strong sense of movement in your garden! Then stand aside and enjoy the compliments!